Male northern cardinal, Cardinalis cardinalis. Click to enlarge. It was a cold week in New York. As I sat writing at my desk by the window I saw the neighborhood birds in another light. One of the ways birds keep warm is by fluffing up their insulating feathers; they looked like puffballs all week. European house sparrow, Passer domesticus. They have other ways to keep warm. Their feet are thermally isolated from their bodies by a network of blood vessels that cool outgoing blood and warm the returning flow. They also can stand on one leg with the other inside the warm cover of their feathers. Sone huddle together at night to share warmth. City birds are good at finding warm spots to sleep near like chimneys or lights, and on eaves. An old building I worked in attracted a red-tailed hawk on cold nights; it slept on the sill of a window that was so leaky that the perch was practically toasty. Another thing that helps keep birds warm in cold weather is eating high calorie foods. When snow covers the ground, even the most resourceful city birds have trouble finding food. My little porch gets covered with snow but I brush off the dormant planters and put food in them: sunflower seeds, safflower seeds, peanuts, grapes, raisins, perhaps some bits of apple and whole grain bread. Below are summer photos of the neighborhood birds that have been visiting. 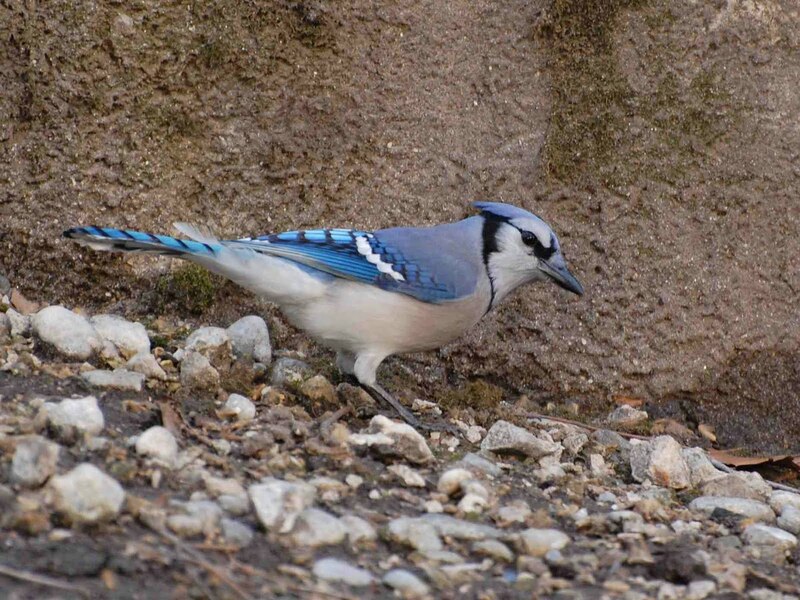 The blue jay, Cyanocitta cristata, announces its arrival with chime-like musical calls. A pair have been showing up together all week. They eat seeds and peanuts. Each takes one seed at a time to a perch in the little tree close by. The bird holds the seed in its feet, pecks with its bill, then pulls the seed out, eats it, and comes back for more. Very labor intensive! A house sparrow might show up alone but is soon followed by a flock. 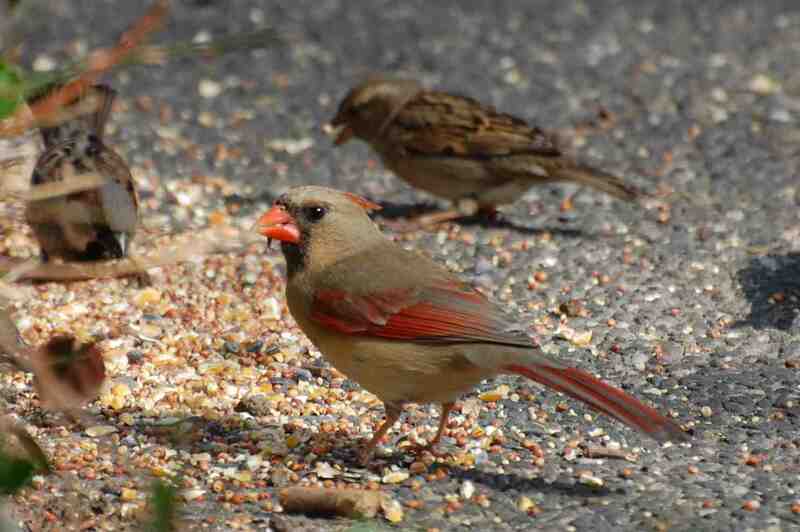 They eat everything, including safflower seeds that they are reported to eschew. Maybe Brooklyn's house sparrows have a cosmopolitan taste for foreign foods. The male northern cardinal preferentially takes whole peanuts. He flies away with them and returns in a few minutes for another. I know when he has arrived because I hear his quiet tick tick tick. After peanuts, sunflower seeds are his next favorite thing. He stabs at grapes eating beak after beak full of fruit. The female cardinal has arrived alone or with a male every day. White-throated sparrows, Zonothrichia albicollis, normally feed in the underbrush by scratching at leaves. They are good in snow, too, tossing it up with their feet and flapping wings to uncover seeds. A few of them come to my porch to look for food throughout the winter. Morning doves, Zenaida macroura, seem passive with the other birds, but make up for it by eating faster. They don't open the seeds before eating them, like most of the other birds. They just peck them up, shell and all, one peck per seed. Very efficient! American robins, Turdus migratorius, don't all migrate away for winter. They do change their eating habits. No worms are available. They disappear from lawns and go foraging for dried berries. Click here to read more details in a previous blog. One or two are spending the winter near my place; the apples, grapes, and raisins are for them. And they like an occasional nibble of whole grain bread. You've got to hand it to those sparrows for their adaptability. A little pet food for the robins makes sense; I will try it. 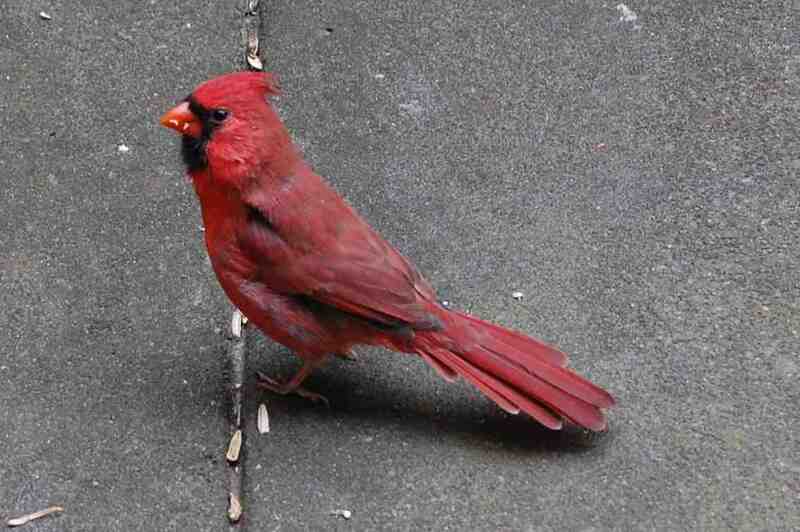 Some of those bird photos don't look real--like the ones of the male cardinal and the bluejay. What kind of camera do you use? And of course, besides the cardinal, my other most favorite bird is the robin. Nice to see it. Don't get many out here in San Diego unless I head to the mtns. So glad to read that you are feeding them what they need in the winter!